Facilitate teacher exchange and collaboration with respect to best practice in science teaching and learning. Use exchange and collaboration to extend and develop the expertise of two groups of teachers. 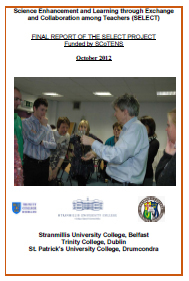 A group of Dublin-based teachers who, in partnership with science education staff from St Patrick’s College Drumcondra, have developed an expertise in classroom practice relating to the ‘Nature of Science’ (NoS) will disseminate and model their practice to a group of teachers from Belfast. The Belfast based teachers who in partnership with Queen’s University and Stranmillis University College Belfast, have developed an expertise in ‘Creative Science Investigations’ (CSI) will in a similar way work to develop this practice with their southern partners.